Connexion avec les fluides complexes, la matière molle et les systèmes biologiques. Sur le thème de la micro- et nano-fluidique, les objets d’étude, physico-chimiques (gouttes, capsules,…) et biologiques (vésicules, globules rouges,…), comprennent aussi les procédés intensifiés d’encapsulation et de vectorisation par microréacteur, thèmes en plein essor. 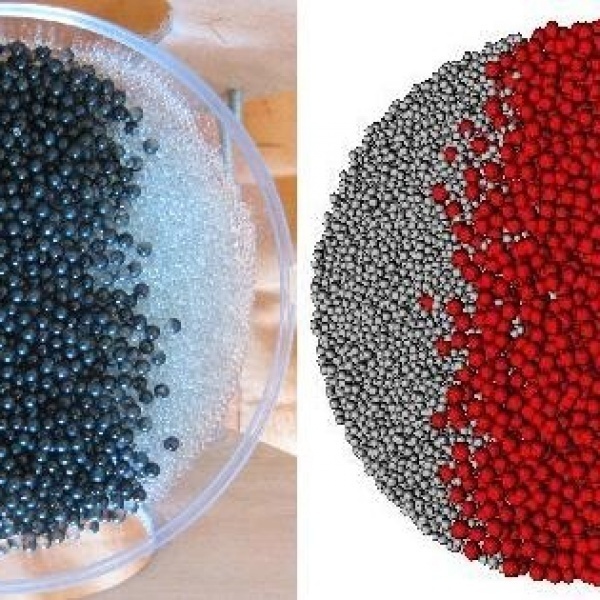 L’équipe développe également des outils de caractérisation de l’organisation aux petites échelles comme le développement de simulations numériques pour rendre compte de la ségrégation obtenue au sein de milieux granulaires et la mise au point de méthode chimique de caractérisation des effets de micromélange (mélange à l’échelle moléculaire). A cela s’ajoute une activité de caractérisation et modélisation thermodynamique de milieux complexes. Evaporation of a liquid droplet resting on a heated substrate is a complex free-surface advection-diffusion problem, in which the main driving force of the evaporation is the vapor concentration gradient across the droplet surface. Given the uncertainty associated with the diffusion coefficient of the vapor in the atmosphere during space evaporation experiments due to the environmental conditions, a simple and accurate determination of its value is of paramount importance for a better understanding of the evaporation process. Here we present a novel approach combining numerical simulations and experimental results to address this issue. Specifically, we construct a continuous function of output using a Kriging-based response surface method, which allows to use the numerical results as a black-box with a limited number of inputs and outputs. Relevant values of the diffusion coefficient can then be determined by solving an inverse problem which is based on accessible experimental data and the proposed response surface. 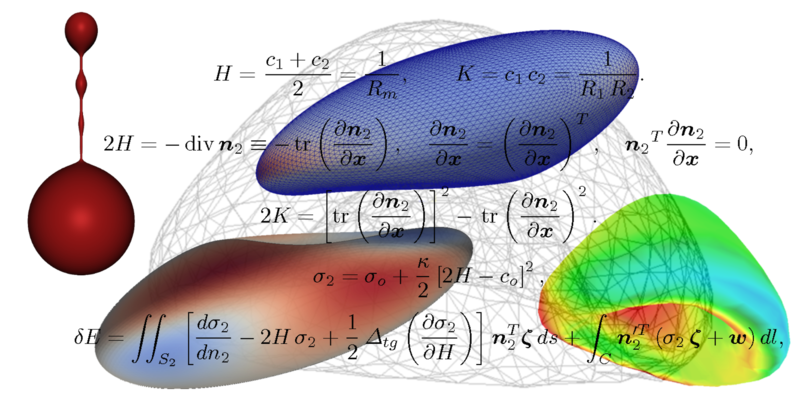 In addition, on the basis of our numerical simulation results, we revisit a widely used formula for the prediction of the evaporation rate in the literature and propose a refined expression for the droplets evaporating on a heated substrate. The red blood cell (RBC) membrane is a composite structure, consisting of a phospholipid bilayer and an underlying membrane-associated cytoskeleton. 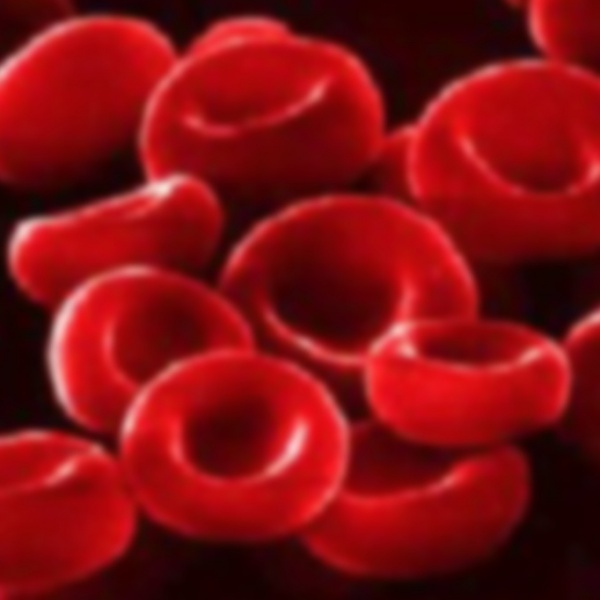 Both continuum and particle-based coarse-grained RBC models make use of a set of vertices connected by edges to represent the RBC membrane, which can be seen as a triangular surface mesh for the former and a spring network for the latter. Here, we present a modeling approach combining an existing continuum vesicle model with a coarse-grained model for the cytoskeleton. Compared to other two-component approaches, our method relies on only one mesh, representing the cytoskeleton, whose velocity in the tangential direction of the membrane may be different from that of the lipid bilayer. The finitely extensible nonlinear elastic (FENE) spring force law in combination with a repulsive force defined as a power function (POW), called FENE-POW, is used to describe the elastic properties of the RBC membrane. The mechanical interaction between the lipid bilayer and the cytoskeleton is explicitly computed and incorporated into the vesicle model. 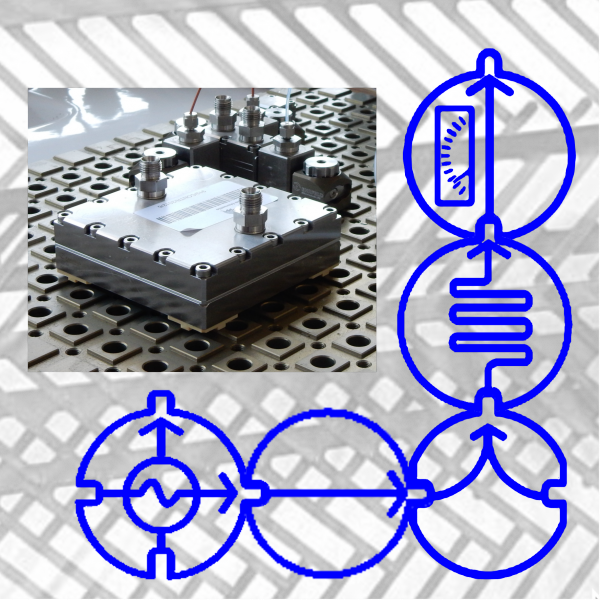 Our model includes the fundamental mechanical properties of the RBC membrane, namely fluidity and bending rigidity of the lipid bilayer, and shear elasticity of the cytoskeleton while maintaining surface-area and volume conservation constraint. We present three simulation examples to demonstrate the effectiveness of this hybrid continuum--coarse-grained model for the study of RBCs in fluid flows. To better understand the velocity field and flowing layer structure, we have performed a detailed discrete element method study of the flow of monodisperse particles in a partially filled three-dimensional cylindrical rotating tumblers. Similar to what occurs near the poles in spherical and conical tumblers, recirculation cells (secondary flows) develop near the flat endwalls of a cylindrical tumbler in which particles near the surface drift axially toward the endwall, while particles deeper in the flowing layer drift axially toward the midlength of the tumbler. Another recirculation cell with the opposite sense develops next to each endwall recirculation cell, extending to the midlength of the tumbler. For a long enough tumbler, each endwall cell is about one quarter of the tumbler diameter in length. Endwall cells are insensitive to tumbler length and relatively insensitive to rotation speed (so long as the flowing layer remains flat and continuously flowing) or fill level (from 25% to 50% full). However, for shorter tumblers (0.5 to 1.0 length/diameter aspect ratio) the endwall cell size does not change much, while center cells reduce their size and eventually disappear for the shortest tumblers. For longer tumblers (length/diameter aspect ratio larger than 2), a stagnation zone appears in between the central cells. These results provide insight into the mixing of monodisperse particles in rotating cylindrical tumblers as well as the frictional effects of the tumbler endwalls. "Comment nos bronches évacuent le mucus"
M2P2 est à l'initiative de la Conférence-débat autour de l'ouvrage "Étonnant vivant" /CNRS Ed. Résumé: The prediction of the performance of pressure-driven membrane separations, deeply affected by concentration polarization, would be an important advance for process design and optimization. In this context, the dimensionless coupled Navier-Stokes and solute conservation equations are solved numerically for a steady laminar cross-flow filtration. The two-dimensional flat channel consists of permeable walls subject to solution-diffusion boundary conditions. The permeate flux, the rejection rate and the retentate's flow rate, concentration and pressure drop are determined locally. The simulations highlight the influence of the membrane solute and solvent permeabilities on concentration polarization and the non-asymptotic dependence of the rejection rate on the applied pressure. 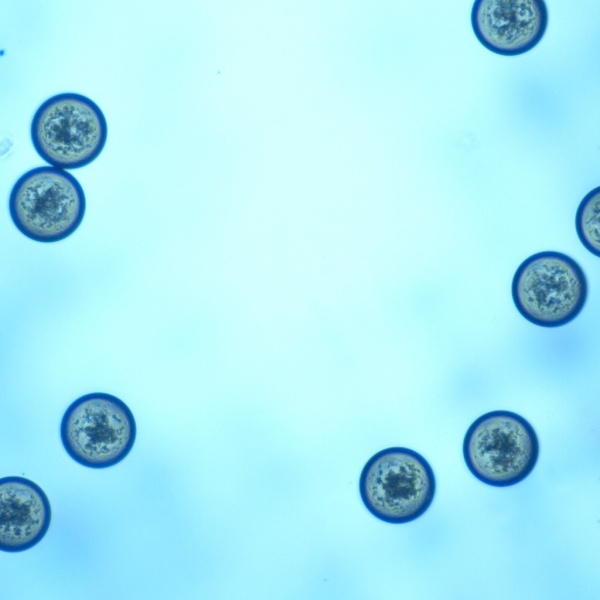 The model is validated for reverse osmosis and tight-nanofiltration plate-and-frame and spiral-wound modules by comparison to experimental results from the literature and from our own pilot desalination tests. Furthermore, a bench-scale method enabling the determination of solute and solvent permeabilities from osmotic-diffusive experiments is developed and applied to reverse osmosis and nanofiltration membranes. The divergence between the transport mechanisms engendered by pressure and by an osmotic gradient is evidenced. 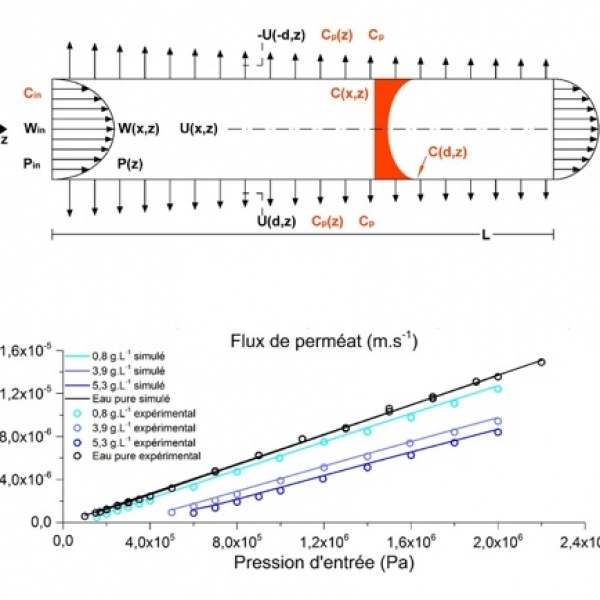 The numerical model and the experimental method are new promising tools with immediate applicability in the membrane field.